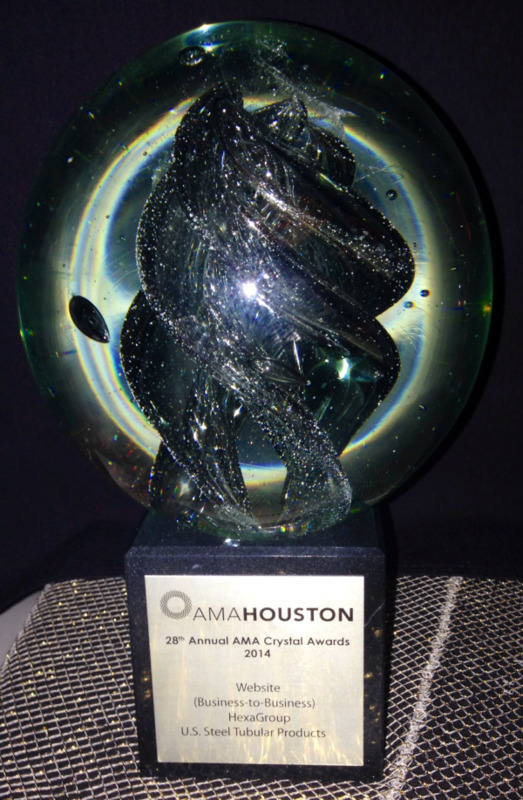 HexaGroup received the Crystal Award for the Business to Business Website category at the 28th Annual Crystal Awards, AMA Houston's premier event and one of the largest marketing awards programs in the country. The Crystal Award - B2B Website was presented to HexaGroup for the recently launched USSTubular.com. The new microsite for U. S. Steel Tubular Products, North America’s largest fully integrated tubular products manufacturer, was built for functionality, interactivity, and responsiveness. The oil and gas division of U.S. Steel has served the energy industry since 1901 and has built a reputation as a strong company proud of its past. Despite its rich history, U. S. Steel Tubular was looking to step it up in the digital marketplace as it found itself challenged with brand erosion and loss of sales opportunities on the World Wide Web. Taking all factors into consideration during the website development process, HexaGroup created a plan to create a microsite for U. S. Steel Tubular Products independent of the main site and dedicated to the Oil and Gas industry. The end goal was to improve user experience and traffic, decrease lost sales opportunities, and reduce sales support calls by eliminating manual processes. To remedy the functionality issues, we developed interactive solutions to better serve potential and existing clients, while lowering customer service calls. A highly secure Licensee Network Application that allows licensees access to over 1000 design documents. An intuitive Distributors and Authorized Agents directory. 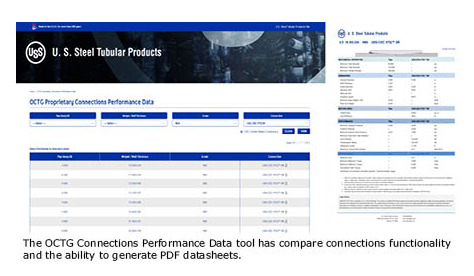 A first-of-its-kind set of three interactive tools capable of generating data sheets and comparing performance data for OCTG connections, API Pipe and Connection, and Line Pipe Products. Unique in the industry, these tools allow engineering audiences to generate PDF datasheets. In addition, the site interface was developed following responsive design methodology, with all interactive tools fully functioning on desktop, tablet, and mobile platforms. The Innovation and Technology Center located in Houston, TX was developed as a branding piece to promote the company’s commitment to technology and innovation, and position it as a thought leader in the industry. This 10,000 square foot education center includes an amphitheater, two conference rooms and a lab-themed meeting room. 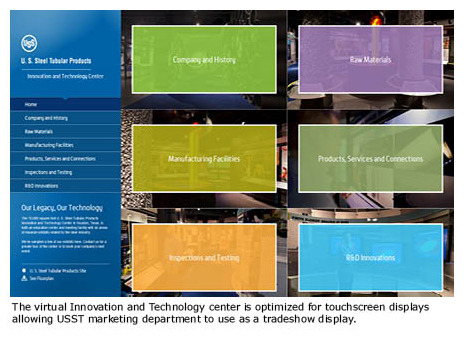 Fulfilling U. S. Steel's desire for it to be experienced by people around the world, HexaGroup created a virtual representation of the center that allows users to interact with the 6 exhibits related to the steel industry either as a website, tradeshow display, and even touchscreen display. The website officially launched on February 28th, and since then, U. S. Steel Tubular Products has seen a significant improvement in user experience and traffic, a decrease in lost sales opportunities, and a reduction in sales support calls as users can find the information they need on the website. In addition, the site was acknowledged at the 28th Annual Crystal Awards in Houston on May 29th, 2014, receiving the Crystal Award for the Business to Business Website category. The event recognizes Houston’s most creative, innovative, and results-driven marketing companies who produced exceptional work for their clients. Do you think HexaGroup could provide the digital marketing solutions you seek for your company? Whether B2B or B2C, can help you make sure your website stands out amongst other companies in your market, and provides visitors with the information they are looking for. Contact HexaGroup and we look forward to helping you reach new highs in your marketing strategy.